The iconic British luxury brand has its share of fakes. How can you tell if the Burberry handbag that you are about to buy online is real? From lining to stitching to brand logos, here’s our top 3 tips to help you spot a fake Burberry bag. The two most popular Burberry patterns are the Classic Check (far right) and the Nova Check (immediate right). The Classic Check has a tan background, with black, white and red stripes of both horizontal and vertical nature. You’ll also notice a faded knight insignia positioned at the intersection of two red lines. The Nova Check pattern is slightly different, with the main discrepancy being that, like the Classic Check, there should be no faded knight insignia. Similarly, the background has a light yellow undertone, and the lines that are red on the Classic Check have a pinkish hue instead. Any bags that deviate from these well know patterns may be fake. 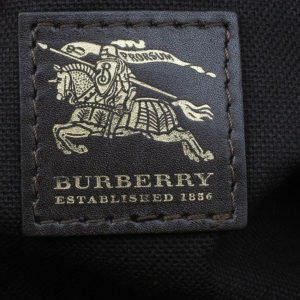 Get up close and personal with your Burberry bag and check out how it’s sewn together. From the handle to the lining inside the bag, the stitching should be straight, neat, even and clean with with no loose threads. If anything looks messy or not quite right, you could be looking at a fake. The bag should have either a metal plaque or a leather tag. The metal plaque should match the colour of the bags hardware, plus an engraving reading ‘Burberry – London’ in the brand’s signature font. Many (but not all) of the leather tags have ‘Made in Italy’ stamped on the back. 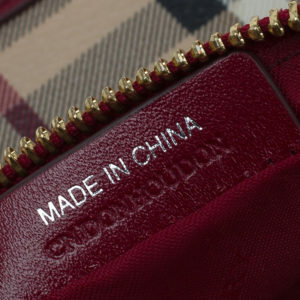 Nowadays, Burberry does make some items in China, especially smaller bags and accessories, so don’t worry if you spot a ‘Made in China’ stamp in the bag. Whether it’s metal or leather, the font of the logo on the stamp or engraving is very distinctive. The left side of the U and the Y are slightly wider and the R’s have small tails.